Affordable Freelance Custom Website Designer, Providing Service to Individuals and Small to Large Businesses Nationwide! I have 40+ websites listed in this portfolio (3 pages) . I do have more sites available to view upon request) Please view screenshots, links and overviews of my website portfolio below. In addition to these websites you can also view my logo designs, banner ads, technicals drawings, flash intros, software development, Proposal Cover Designs, CD Covers, Brochure and Flyer Advertisements, Ad Landing Pages and Forms and more by using the navigation menu above. 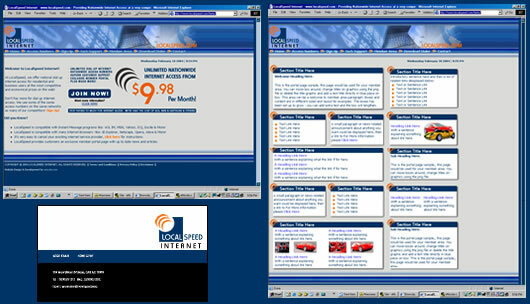 LOCALSPEED.COM: ISP in North Carolina, Site I built includes 3 unique styles of pages for different areas including; Homepage, Several Subpages, Member Portal Page. Also designed logo for this client and set client up with a nationwide network of Internet access numbers along with graphic work for a Accelerator software download. Also created matching Letterhead and Business cards templates for client to use. Site is still under development and will be completed soon. STiLink.com - Nationwide Internet Service Provider. 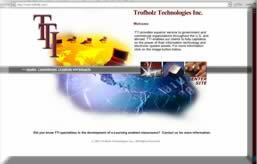 Designed and Developed an ISP site for this telecommunications corportaion headquarted in New York City. They are a leading mobile cell phone provider and now branching out into the world of Internet Access Service. I created the website, developed a support system portal and a member portal page with live news headlines, stocks, weather, and horoscopes plug ins. I also designed the StiLink Logo, CD Covers and Jackets and a few banner advertisements. You can view this site by clicking on the image to the left. I also designed and developed a new site for the publishing house and have created new logos and corporate presence (Shine Publishing House). DBASEMEDIA LLC dBase Media provides result oriented marketing solutions that are accountable to a predetermined ROI metric and they offer media placements based on association to environmental aspects as they relate to psychographics, demographics, contextual content and other like minded values. 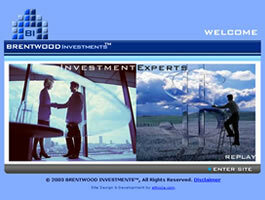 OVERVIEW: I created this website presence for my client located in Northern Virginia/Washington DC. You can view this site by clicking on the image to the left. I also have a Reference Letter on my site from dbasemedia, please click here to read it. TARGET AUDIENCE: Small & Medium and Large Corporations. 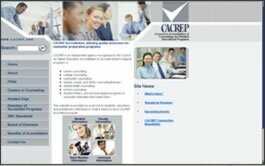 Located in Alexandria, VA, CACREP is an independent agency recognized by the Council for Higher Education Accreditation to accredit master's degree programs. I designed a new website for them and maintain site updates as requested. Please click on the images to visit the website. DIALSTORM.COM: Discount ISP Site I'm building, currently under development. TROFHOLZ TECHNOLOGIES INC. TTI provides Technology Enhanced Training Room Environments, Audio Visual Presentation Systems. Enterprise Network Design with Installation and many more information technology services. TARGET AUDIENCE: Small & Medium Businesses & Government. ALL OVER ROVER AND CATS TOO: I developed a fun fast loading flash animation with honking sound and animated paws and then designed/developed a small 6 page web site for this Mobile Pet Grooming service located in Elk Grove, California. PURESPEED INTERNET (NEW SITE) Purespeed is a Nationwide Internet Service provider (ISP). They offer National dial up access to more than 30,000 cities, towns and municipalities in the U.S. for residential and business users. 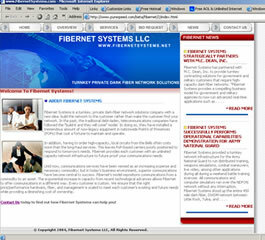 OVERVIEW: I created a new website presence for this Nationwide Internet Service Provider (ISP). I provided full life cycle development from beginning thoughts to final publishing. I Designed/Developed 5 beta sample versions until final was approved. Maintained files on server. 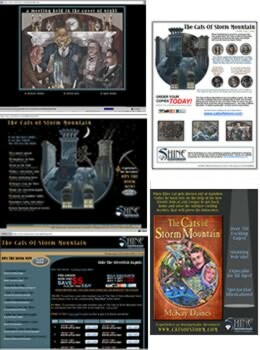 Helped develop site structure, created all pages and template files, created new company logo, creatd national dial-up number listing pages, online tutorials for configuring Dial-Up-Networking using various platforms, online survey forms, scrolling news headlines, a 3-tier drop down navigational menu system, an email login area for members, a daily virus alert plug in, designed multiple ad banner designs, created an online e-commerce sign up page, tested and made site viewable in cross browser platforms (explorer, netscape, opera etc). Created meta tags, listed keywords, created a robots text file for engine crawlers, submitted site to top ranking search engines. I provide ongoing management of files, graphics, edits, custom work, FTP transfers, webmaster support and consultation services. TARGET AUDIENCE: Small & Medium Business & Home PC Users. 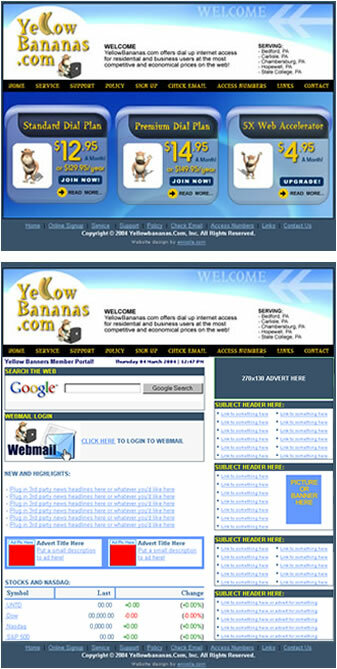 Yellow Bananas Web Site & Member Portal: I created a Redesign of an existing ISP client in Pennsylvania. They wanted to make the site have a fun feel! Very cute site, family oriented, featuring some animation and 3d animated monkey. I also designed and created the Logo for the web and print. BRENTWOOD INVESTMENTS: I performed website design and development along with a new company Logo for this Real Estate Investment Firm in Las Vegas, Nevada. Site features an animated flash introduction with musicical loop. Fibernet Systems LLC is a turnkey, private dark-fiber network solutions company with a new idea: build the network to the customer rather than make the customer find your network. In the past, the traditional debt-laden, telecommunications companies have followed the "build-it and they will come" model. In doing so, they have installed a tremendous amount of now-legacy equipment in nationwide Point's of Presences (POPs) that cost a fortune to maintain and operate. I developed this site which includes special effects with the banner. Site still has some content development growth needed and will continue with the site updates as requested by my client. 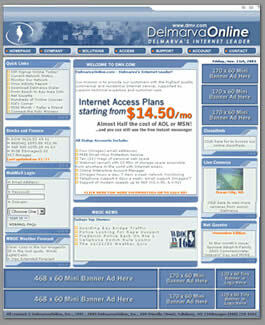 Delmarva: This is a site redesign 'proposed only' sample for a Local TV station and ISP Access provider. Information and overview will be available soon. NORTH HILL PRIVATE SCHOOL: Pivate School in Toronto Canada. I'm performing custom website design & development. This website is in development. You can view the BETA version of this site while it's in development by clicking on the images to visit the beta pages. 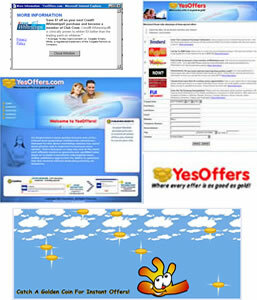 YESOFFERS YesOffers is a Co-Registration lead acquisition solutions for advertisers. Co-regs are one of the most cost efficient means to generate pre-qualified sales leads or to build a newsletter subscription base. Online publishers appreciate the ability to generate top-line revenue without dedicating existing ad inventory. OVERVIEW: Client requested I Design and develop a new web Presense including homepage, ad pages with pop ups, company logo, animated interactive flash banners in 3 sizes, the theme they wanted was 'soft colors and fun'. WWWTOOLZ (WEBMASTERS COMPETITION - I WON!) WWWToolz is home of 'advertisement free' remotely hosted web scripts. The scripts hosted include Counters, Jumpbox, Refer-a-Friend, Mailing Lists, Form-2-Email, Web Polls, Message Boards, Web Search, Site News, Faq Managers. If you don't have a cgi-bin, or have PHP or ASP installed on your server, or, don't know how to make web scripts, WWWToolz can host these fully customizable scripts for you! COMPETITION REQUEST: Design and develop a new website. OVERVIEW: This Site design was for a competition entry. I completed this in about 2 weeks and submitted it to the competition and I won! Many many features to this site! TARGET AUDIENCE: Programmers, Web Developers. GTI TECHNOLOGY CONSULTANTS. GTI Technology Consultants (GTI), is a professional services outsourcing firm headquartered in Frederick, Maryland with additional satellite offices near larger customers. GTI areas of expertise include: Dynamic Web Technologies, Information Technology Support, Administrative Support, Document Imaging & Production Scanning. OVERVIEW: I created a new web site for this Technology Consulting Company located in the Washington DC Metropolitan Area. I also created and an online animated Flash presentation with my own voice-over, which I also developed and distributed on mini business card cd's. I provided full life cycle web development from beginning thoughts to final publishing of site. I Designed/Developed 2 beta phase versions until final was approved. Maintained files on company server. Helped develop site content and structure, created pages and template files, created onine version of animated company logo, developed moving flash menu effects, created online request forms, designed a flash introduction page, tested and made site viewable in cross browser platforms (explorer, netscape, opera etc). Created meta tags, listed keywords, created a robot text file for engine crawlers, submitted site to top ranking search engines, also created a paper marketing brochure with matching graphics and information. I provide ongoing management maintenance as requested. I also have a Reference Letter on my site from gtechinc's president Mr. Gaver, please click here to read it. TARGET AUDIENCE: Small, Medium & Large Corporations & Government. ITENIO & OLDER ZYLAB WEBSITE (NO LONGER IN USE). OVERVIEW: This is my old animated flash website, completely built in flash. I still like it, but not everyone has high bandwidth and can wait for it to load so I developed this new blue/grey site which has just a flash section inserted into the banner above. Which site do you prefer; all flash like my old one on the left or a combination of flash and html like I have now? email me and let me know. OVERVIEW: I created a new website presence for this National Communications Provider. I provided full life cycle development from beginning thoughts to final publishing. I Designed/Developed 1 beta sample version and it was approved for final. I created several samples for company logo and made final from the one picked. I designed graphics, flash animations, mouse-over effects, mail account login areas, a 3-tier drop down navigational menu system, created all pages, template files and cascading style sheet (css), created meta tags, listed keywords, created a robots text file for engine crawlers, submitted site to top ranking search engines. I provide ongoing management of files, graphics, edits, custom work, FTP transfers, webmaster support and consultation services. TARGET AUDIENCE: ISP's and Potential VARs. PURESPEED INTERNET (OLD SITES) Purespeed is a nationwide internet service provider (ISP). They offer national dial up access to more than 30,000 cities, towns and municipalities in the U.S. for residential and business users. THIS SITE IS NO LONGER IN SERVICE, I ALSO DESIGNED A NEW SITE FOR PURESPEED, WHICH IS LISTED AT TOP OF THIS PAGE. 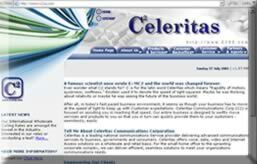 OVERVIEW: I developed 3 websites for this nationwide Internet Service Provider (ISP) web site in both English and Spanish versions and developed a Wholesale site for resellers. (I have since replaced this site with a new design but you can still click on the pictures to see the old design as i have kept them on the server for viewing purposes only). The 3 separate cross browser compatible sites I designed, developed and maintained on company server includes over 180+ pages viewable in English and Spanish. I designed multiple ad banner designs, created an online e-commerce sign up page. .The site is cross browser compatible and includes new graphics, national dial-up number listing pages, online tutorials for configuring Dial-Up-Networking using various platforms, forms, scrolling news headlines, mouse-over effects, email login area, online surveys, a virus alert plug in, ad banner designs, an online e-commerce sign up page and much more! LEESBURG DIAL. Leesburg Dial brings together Internet and the community of Leesburg, Virginia. For the internet, they have ISP services that access to five of the best Networks across the U.S. and Canada. For the community, they have links to local business, schools, government, health care and much more! OVERVIEW: I developed a new 'community themed' website for this company located in Northern Virginia. The final site I designed, developed and maintain on a host server includes a 3-tier navigational menu, new graphics, online signup, sitemap, mail logins, terms or service, i did a lot of research to find local community links for this site. Site features local business and resources.I created entire site structure and pages, meta tags, listed keywords, created a robot text file for engine crawlers, submitted site to top ranking search engines, also created a paper marketing brochure with matching graphics and information. I provide ongoing management maintenance as requested. 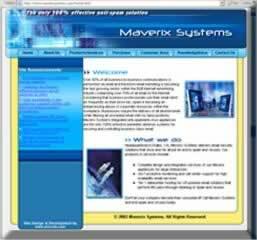 MAVERIX SYSTEMS Maverix Systems delivers email security solutions that once and for all put an end to spam and viruses. There products and services include: Complete design and integration services of our Maverix appliances for large enterprises, 24x7 proactive monitoring and call center support for high availability email services and Tier 1 datacenter hosting for off-premise email solutions that perform MX pass-through cleaning of spam and viruses. REQUEST: Design and develop a new company web site. Maintain files on company server, submit site to top ranking search engines, provide ongoing webmaster support. OVERVIEW: The final site I designed, developed and maintain on a host server includes a 3-tier navigational menu, new graphics, sitemap and more! REQUEST: Design and develop a new company web site. Maintain files on company server, submit site to top ranking search engines, create onine animated version of company logo and provide ongoing webmaster support. OVERVIEW: The final site I designed and developed while working with gtechinc.com includes bio of David Brinkley, a navigational menu, new graphics, sitemap, Maryland resources and links and much more! I also have a Reference Letter on my site from Mr. Brinkley, please click here to read it. Need Affordable Freelance Custom Website Designer in Virginia? I Provide Services to Individuals and Small or Large Businesses Nationwide! Get Professional Custom Website Design, Based in Virginia, I provide web design services to Individuals and Businesses Nationwide!